This weeks book is an all time favorite, The Very Hungry Caterpillar . We fell in love with this book when K was just one. 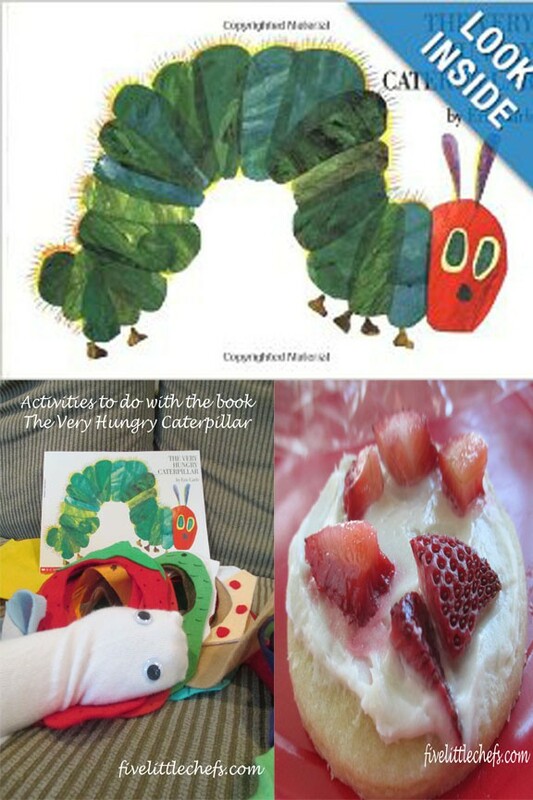 It is a cute story about a caterpillar who is very hungry and eats all these different things, but gets sick. In the end only one leaf makes him feel well enough. It’s always fun to have my kids guess what is going to happen throughout the book. Have your kids tell you what happens at the end of the book, and then read to see if they were right. The illustrations in this book are bright and fun to follow for little kids. 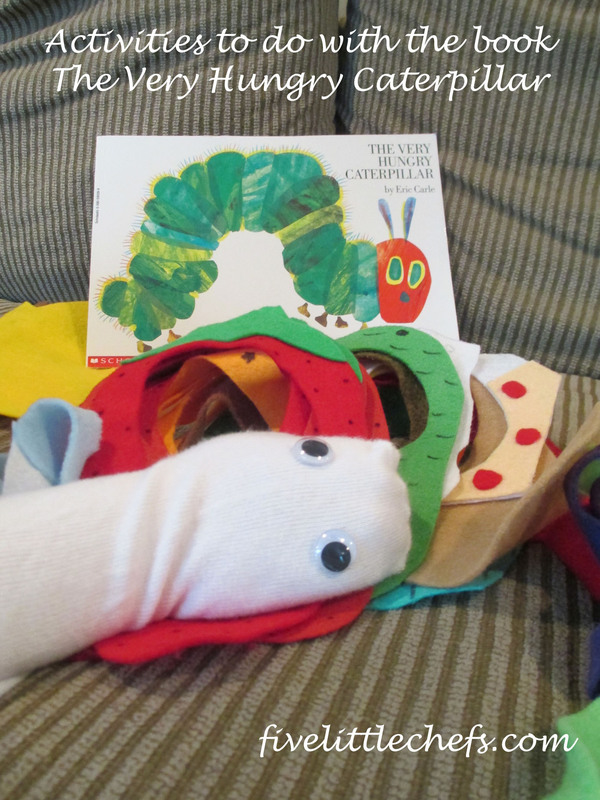 A few years ago my sister gave K a wonderful present to go along with the book, The Very Hungry Caterpillar. She made a sock puppet caterpillar and cut out all the different food items it eats with felt (see above picture). It has been so much fun to be able to interact during this book! Now that we have a one year old and K is turning 5, he is able to show B what happens throughout this book with the puppet. I highly recommend making some. It makes this book that much more fun. And, your older kids can tell the story with the puppet to the younger kids. Also, why not do it for a birthday party?!? We love making treats and giving them to neighbors and friends. 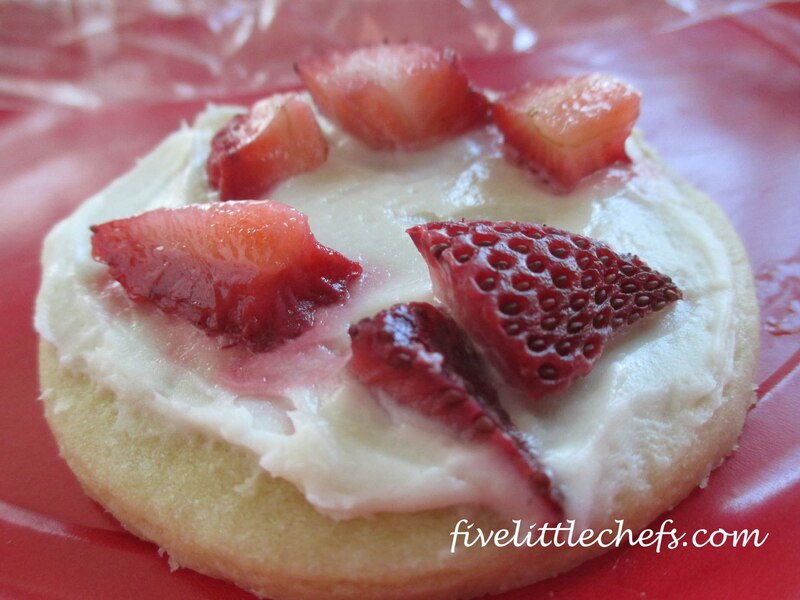 Why not make cookies fun by adding some fruit that was talked about in the book. Here we put sliced strawberries on top. Not only is it yummy, but it makes you think your cookies are a little more health, right? No Replies to "The Very Hungry Caterpillar"